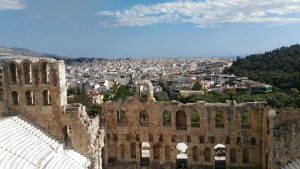 This is the second part of my travelogue regarding my trip to Greece back in May 2017. The first installment is Part I: Microaggressions in Mykonos, and is written through an intersectional lens, particularly through the color of my skin. Continuing with the discussion of intersectionality, this latest installment focuses on gender, as a woman of color (WOC). 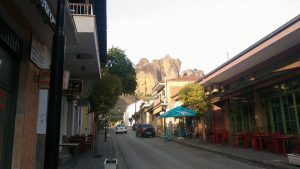 One of the main streets of Kalambaka, a small town at the foot of the famous Meteora rock formations. Like many Greek towns, the late dinner scene is a bustling way of life. Photograph by Annie Tang. “We’ll walk you back to your hotel!” I am in the small, mountain town of Kalambaka and night has fallen. Myself and the young French-Canadian women whom I’ve befriended have just finished a lovely dinner at the taverna, joined by kind locals old and young, including young men. Aware that I am solo-traveling, the French-Canadians immediately offer to walk me back to my accommodations. (After all, lady travelers gotta look out for each other!) Upon this news, the men, quick to be gentlemen, tell us they want to walk us back. Without asking. We women glance apprehensively at each other for a quick moment, agree, and head on our way–fortunately uneventfully. Sometimes adventure includes not knowing exactly where you are. 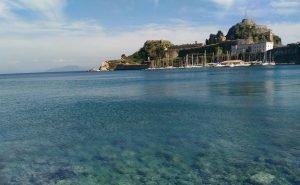 This image was taken on a small bay (name unknown) across from the Old Fortress in Corfu Town, Corfu Island. Photograph by Annie Tang. There are small ways, but many instances, in which women go through their lives with a thin layer of anxiety for our well-being in a public setting with male strangers. Should I immediately go home before dark? I really hope a friend walks me back. How friendly should we get with these guys we don’t know? I hope no one says anything inappropriate to me about my body. I wish those men would stop cat-calling me. These feelings are intensified while abroad. For me, this is compounded by the fact I look like a foreigner in the Western countries I visit. While I do possess the privilege of being a straight, lightskinned person of color (POC), I have had my share or have witnessed everyday sexism and street harassment at home and away. Overlooking one of the only surviving amphitheaters (still used today) in the ancient Acropolis archaeology site in urban Athens. Photography by Annie Tang. From the non-Asian men who like to flirtatiously call out “ne hao!” (I don’t speak Mandarin) to the ones who make comments about my figure as I walk to work at Eisenhower Library, this is unfortunately everyday public behavior women have to put up with, but not necessarily tolerate. While enjoying a solitary bask in the sun on a locals-only beach near Corfu Town, a man decided to sit three feet away from me on the empty beach. My personal space felt invaded to say the least. I witnessed a similar interaction when on a city bus in Athens: after entering our bus, a large man with several bags sat next to what appeared to be another young woman traveler like myself–when there were plenty of empty seats! She was visibly uncomfortable that this stranger had invaded her space and actually awkwardly extricated herself from her window seat to escape to the other side of the vehicle. As iterated in the first installment of this blog post, implicit racism does not stop me–nor plenty of other young women–from solo traveling, and neither does soft sexism or public harassment. We are explorers of cultures and societies, including our own, and with those cultures and societies come the failures of how we humans treat each other. Rising above these inadequacies though, I am proud to see many young POC women travel bloggers, getting out there, voyaging, traversing, adventuring. The world is out there, and my sisters are coming for it. Thanks for sharing your blog . Really interesting insights and statistics. Travel blogs are really important for the traveler to know about that area. Love your post. Got interesting information here.